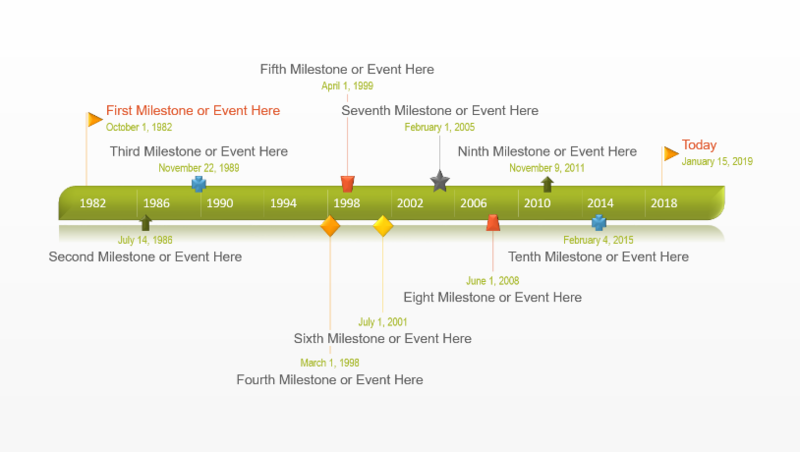 timelines using MS Project and PowerPoint. 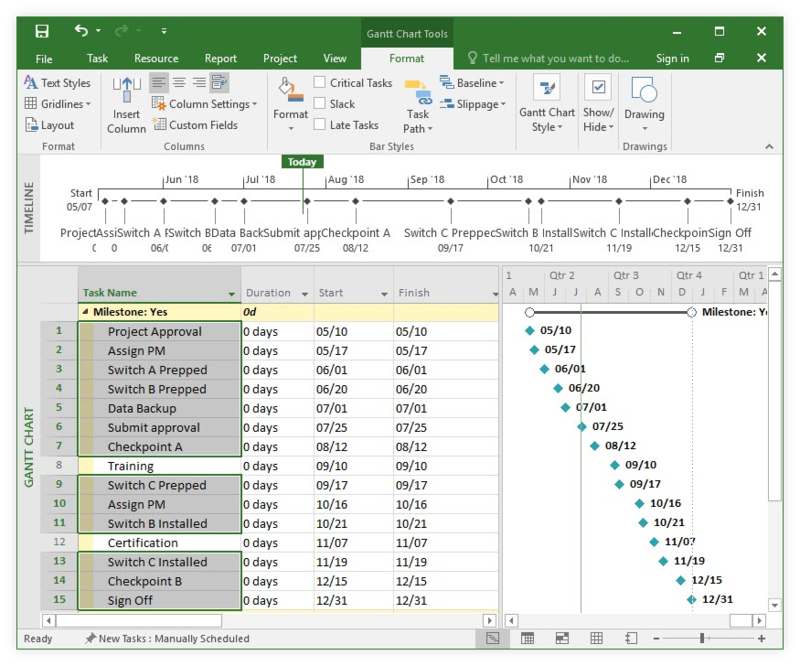 Microsoft Project can automatically create a timeline out of your project’s data, but the resulting visual is often too crowded or complex to follow. 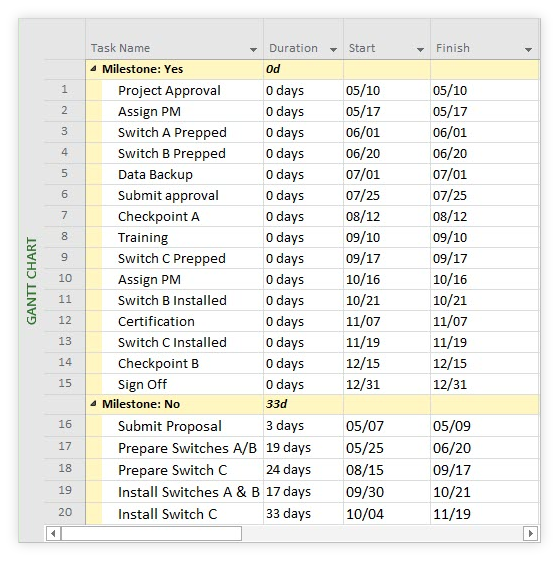 On this page, I will show you two options for turning MS Project data into a clean, easy-to-understand timeline fit for presentations to high-level audiences. 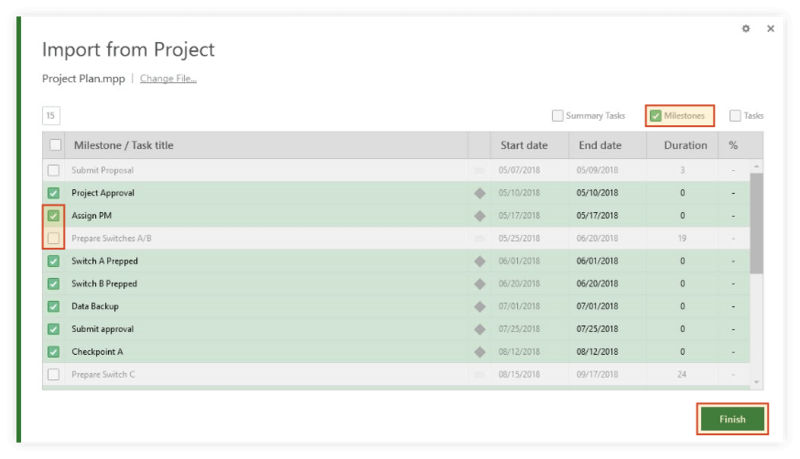 The first tutorial uses MS Project’s grouping and formatting options to make an overview timeline, while the other shows you how to instantly import your Project data into PowerPoint and turn it into a beautiful visual slide. 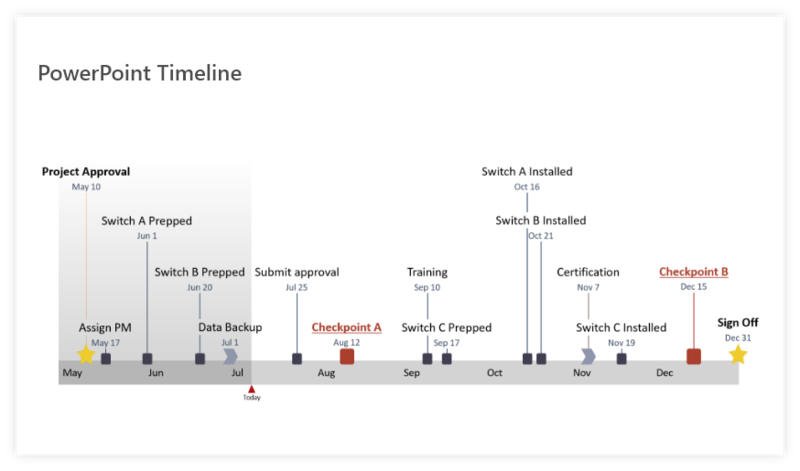 When managing a complex or large project, a clean summary timeline that presents only the key milestones or deliverables of a project may be the best way to share information with non-technical audiences. 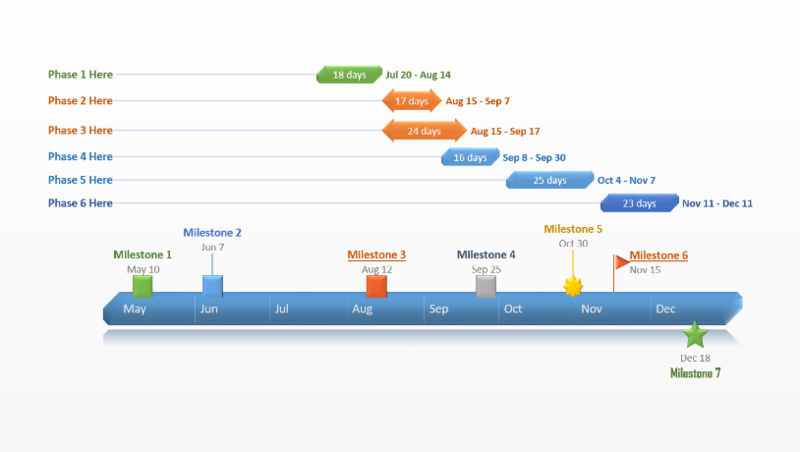 Here’s how to create and format a simple timeline directly in MS Project. Open your .mpp project and go to the View tab on the MS Project ribbon. From here, tick the Timeline checkbox you can see in the Split View group. 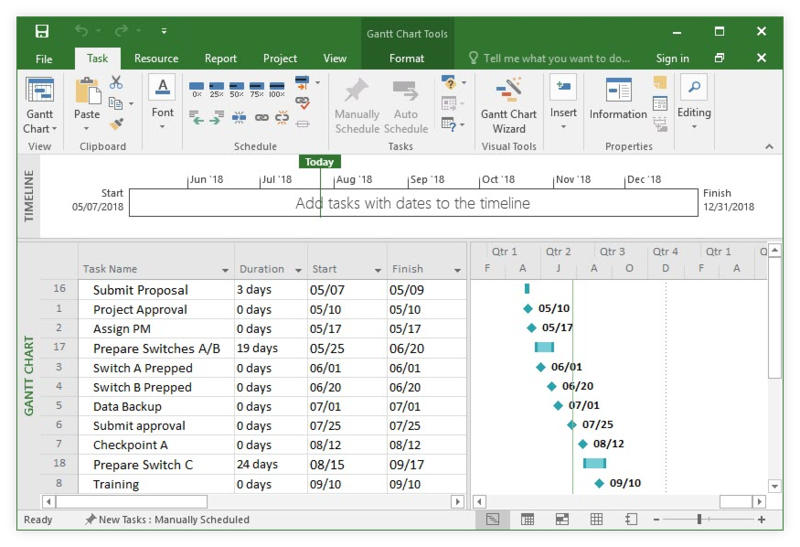 Microsoft Project will add a blank timeline on top of your Gantt Chart View. Click on the small down arrow on the Task Name header in your project table. From the menu that pops up, go to Group by and select Milestones. 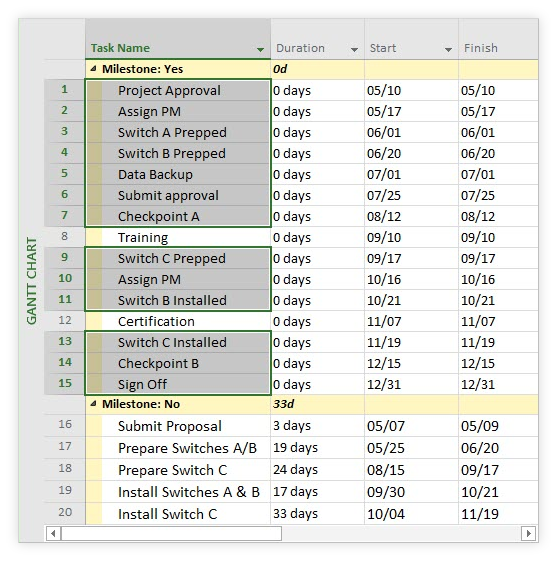 Microsoft Project will automatically separate your milestones from the tasks and move them all high up in the sheet so you can identify them instantly. Now that your milestones are all grouped together nicely, you can quickly select them all using Shift + Click or pick only a few key ones by holding Ctrl while selecting their corresponding cells. 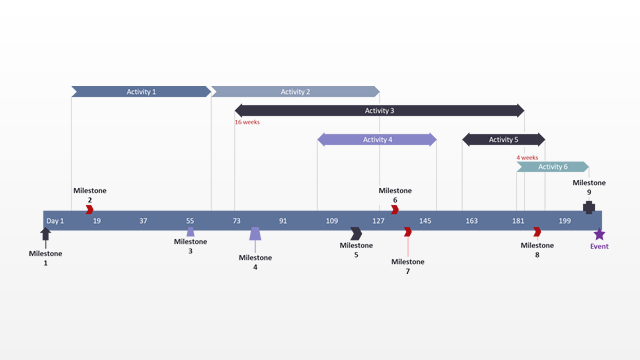 For this example, I’ll select all but two milestones from my Project spreadsheet. 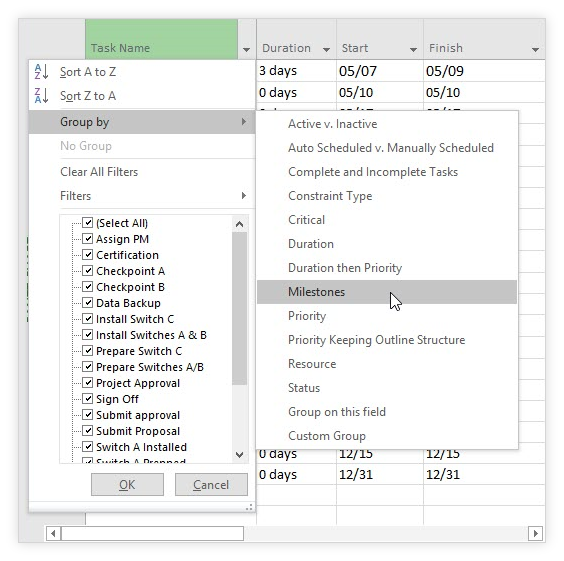 Note: Make sure not to accidentally select the summary row (“Milestones: Yes”) as it cannot be added to the timeline and, if it’s included in your selection, it will prevent you from adding the rest of your data too. Once you’ve selected your milestones, right-click anywhere inside the selection and then choose Add to Timeline from the pop-up menu. 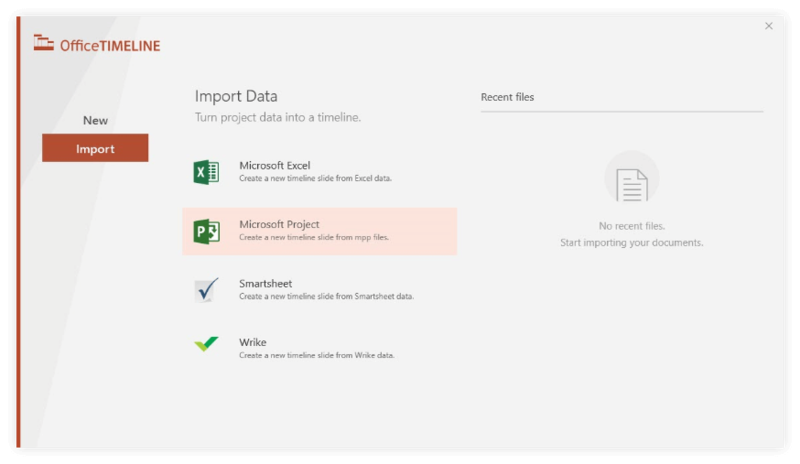 Microsoft project will instantly add the selected data to your timeline. 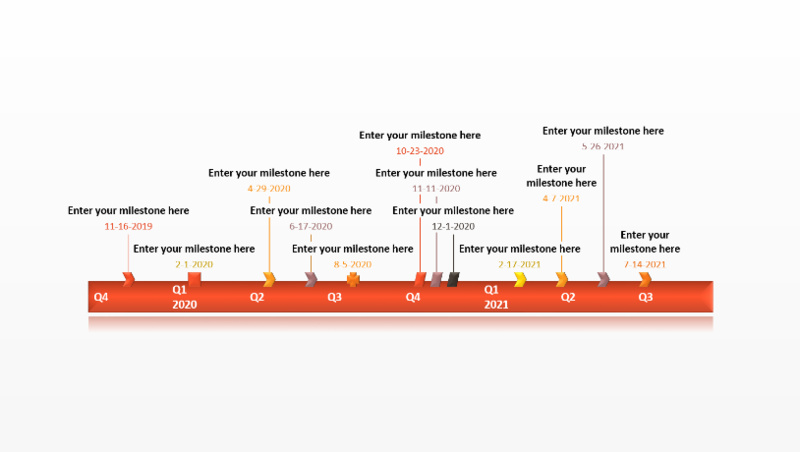 Now, if you wish to add extra milestones to the graphic, you can do it at any time either from the project table following the steps described earlier, or by using the Timeline Tools. For the latter, click anywhere inside the Timeline View and go to the Timeline Tools Format tab. 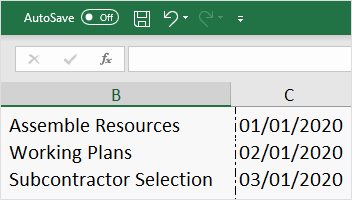 Here, from the Insert group, you can use the Existing Tasks button to add milestones you already have in your spreadsheet, or click on the small Diamond icon to create a new milestone. You may also want to remove items from the graphic if your timeline gets too crowded or if your plans change. 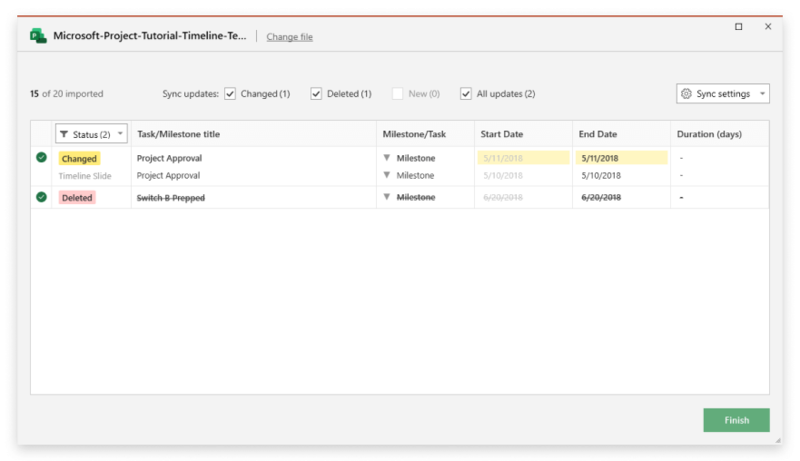 To do so, select the milestone you wish to take out and, in the Timeline Tools Format tab, click on Remove from Timeline. 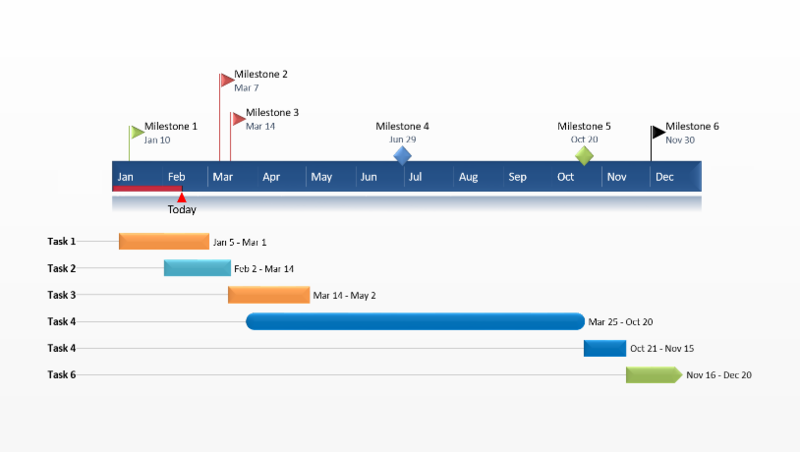 Don’t worry, milestones removed from the graphic will not be deleted from your data file – they’ll still be available in the Gantt Chart View, so you can quickly add them back to the timeline later if you need to. 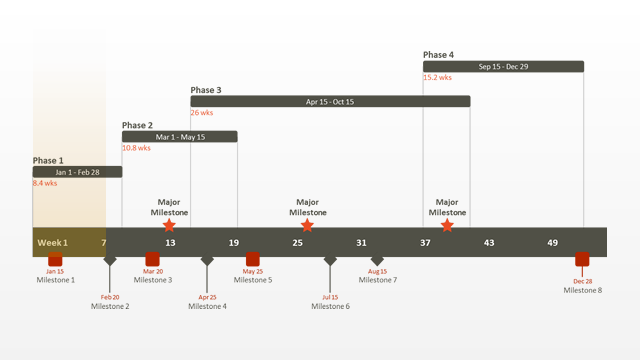 You’ve probably already noticed that the default timeline generated by MS Project is not exactly easy to read. Here’s how you can customize it to make it more presentable. If you have overlapping milestone labels like I did, you can reposition them higher or lower on the timeline to make room for all texts. From your graphic, simply select the label you wish to move and drag it to the desired position. I’ve found that alternating milestones above and below the time scale helps optimize space and creates a clean, uncluttered layout. Now, to make the timeline more eye-pleasing, you can customize all texts on the graphic. To do so, click on the Text Styles button from the Timeline Tools Format tab. A dialogue box will pop up, allowing you to easily change text fonts, colors, styles, and sizes. 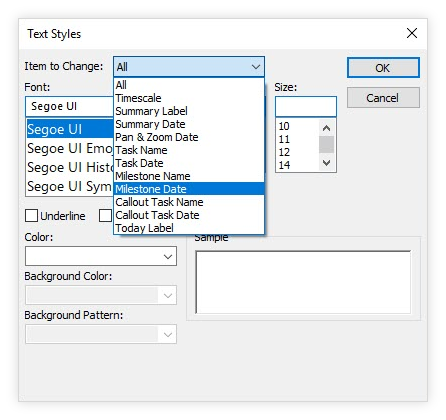 You can choose to apply the same formatting to all items on the graphic, or to customize only particular groups, such as Milestone Dates, Timescale text, or the Today Label. On my timeline, I chose to change all Milestone Dates and the Today Label to a dark Gold. 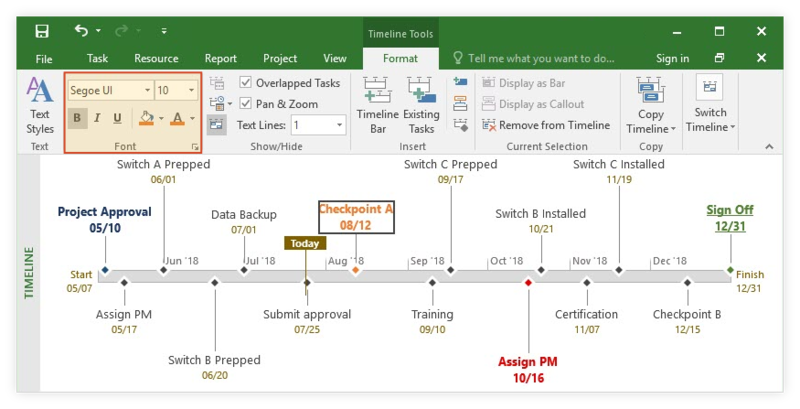 Microsoft Project also lets you customize individual items on the timeline, which can help you diversify your graphic or draw attention to important data. Simply select the desired item and change the formatting using the buttons that appear in the Font group of the Timeline Tools Format tab. For instance, you can recolor a text using the Font Color button and change the color of the timeline bar or that of a milestone diamond by clicking the small Paint Bucket icon. Once you’re done customizing, you can use the Copy Timeline button on the Format tab to insert your graphic into an email message or a PowerPoint slide. Quick tip: You’ll notice that the items on the timeline will be pasted as individual, editable elements by default. While this does provide opportunities for further editing, it also means that the objects and overall layout can get distorted if you try to resize the graphic after pasting it into another document. If the graphic is too wide to fit a slide or email message properly, you can avoid any distortions by resizing the MS Project window before clicking Copy Timeline. 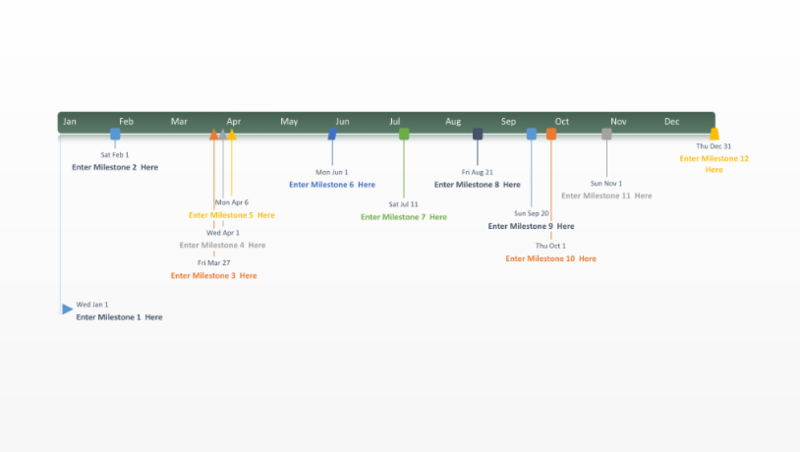 Although it is possible to make a timeline in MS Project, PowerPoint is a better choice for creating visuals that will be used in high-level communications. 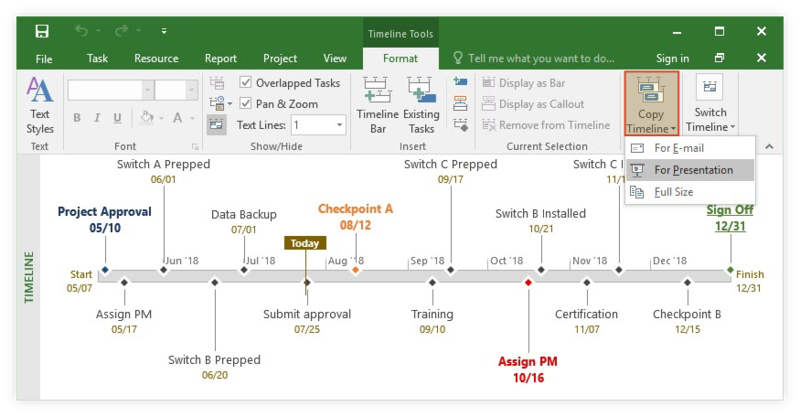 Below I will demonstrate how to instantly turn raw MS Project data into a stylish timeline slide using a PowerPoint add-in called Office Timeline. 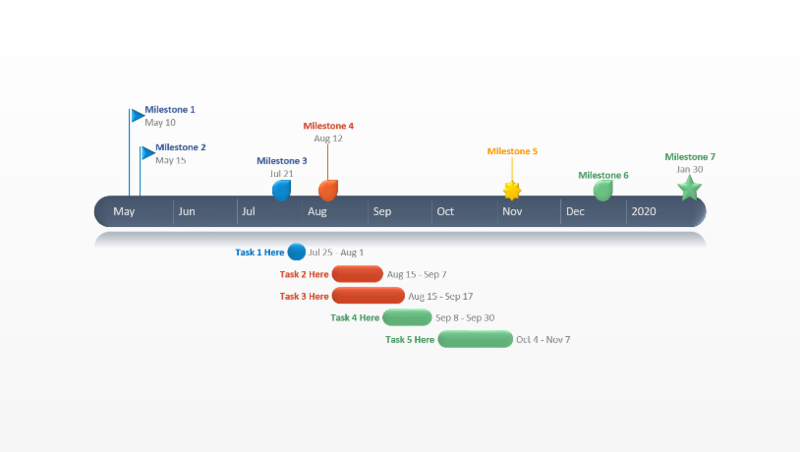 Once created, the visual can be easily customized and updated automatically when plans change. Before getting started, you need to install Office Timeline Plus, which will add a new tab to the PowerPoint ribbon. Inside PowerPoint, click the Import button on the Office Timeline+ tab. In the Import wizard, select “Microsoft Project” from the options available and then pick the .mpp file you want to load into PowerPoint. Now, from the data list, you can choose exactly what MS Project records you want to import into PowerPoint. Use the checkboxes above the list to select or deselect whole categories, or the ones on the left to include or remove individual rows. Once ready, click Finish. After making a few styling choices, my timeline looked like the one below - and it took less than a minute to make. 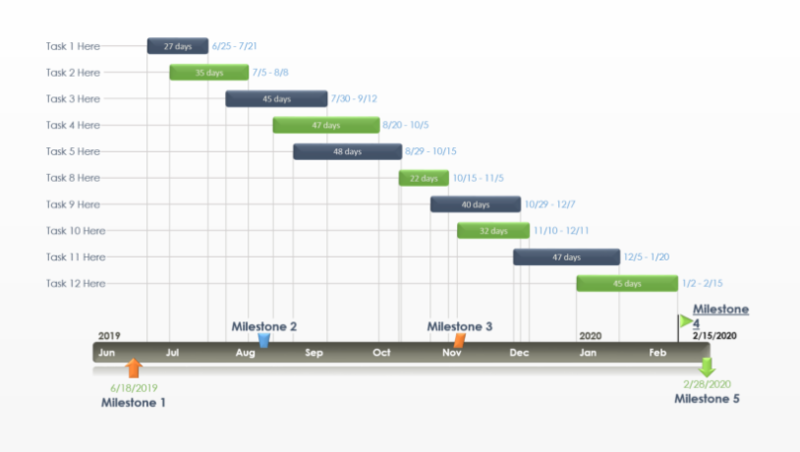 Your timeline slide can be updated in real time whenever your Microsoft Project file changes. 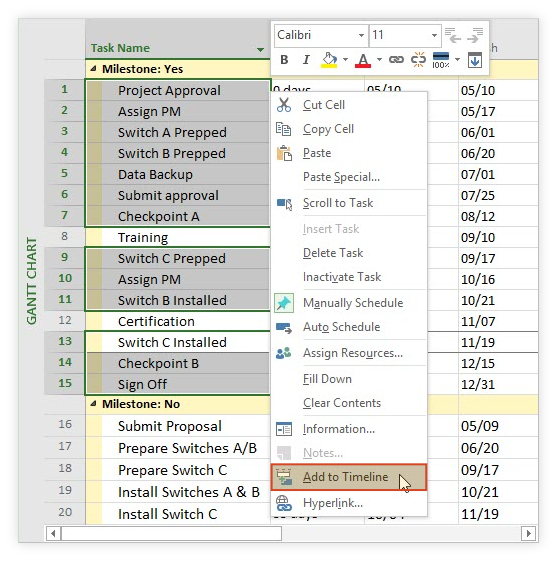 After making adjustments to your Project plan, simply click the Sync button on the Office Timeline ribbon in PowerPoint, and the add-in will automatically identify any changes in your .mpp data. Select the ones you want to keep and click Finish to instantly update your PowerPoint timeline.